Until I started thinking about this blog, I had no idea quite how popular hares had become. See below a wonderful selection of whimsical designs. This is a modern rustic look in fresh, leafy greens and warm, earthy tones. Dashing Red March Hares give playful touch to a country scheme. Particularly suitable in a kitchen, study, nursery or cloakroom. Several other colours available. I have just come across an interesting website called Peony & Sage. They sell a great selection of fabrics and accessories in pastels and florals, including this fabulous Hare print. 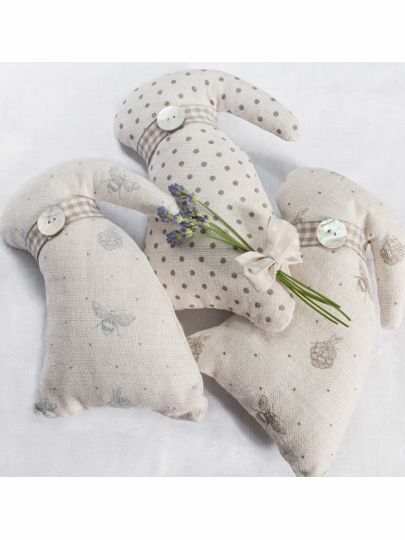 For a nature loving child’s bedroom these Drum Shades in Mini Hares are just perfect. They are available in large and small sizes and in a great selection of colours. They are made by Lolly and Boo and you need to contact Louise at this website if you would like to order one. I recently came across a great website called Thornback & Peel. They sell a wonderful selection of intricate screen printed pieces for the home. These include cushions, deck chairs, aprons and lampshades and I just love this cream cotton cushion with chocolate brown rabbits and green cabbages. Their designs are inspired by artistic traditions from Mrs Beeton’s household management to Mr McGregor’s garden. Then, flicking through Country Living Magazine I noticed a picture of the chair below, and read that Thornback & Peel have recently collaborated with ‘the design lab’ at Sofa.com. A small, exclusive range of their fabrics is available to order on all sofa.com products. I think this chair is fabulous and would sit perfectly in a corner of the kitchen. Really good lighting is crucial in all homes and once you’ve worked out what you need, there is still the tricky question of which fittings to buy. There is a bewildering range of light fittings on the market and unfortunately, an awful lot of them are, well, awful. In order to avoid mistakes, I think it helps enormously to decide what style of fitting you prefer and then to find a small number of suppliers (two or three, but one is fine if they can provide for all your needs) and stick to them. We’ve put together a selection of different types of fittings from some of our favourite suppliers to show you what we mean. Jim Lawrence design and manufacture some of the best light fittings around. They are fairly traditional, although with careful selection, some of their fittings work well in more contemporary homes. Here are some of their products we’d use for classic or country projects. By contrast, more contemporary interiors normally require much simpler light fittings and I particularly like the fittings from Astro Lighting. If your own style is more for clean lines and unfussy design, these types of fittings are likely to work in your home and fit with the rest of your furnishings. For glamorous, statement light fittings, I love these from Ochre. Made from a range of materials including glass, metals, coconut, horn strips and horsehair, they are works of art in their own right and will add more than a touch of style to any interior. For really elegant light fittings, my first port of call would be Heathfield and Co. Their fittings work with a range of interior styles because they are classic and well designed. They also make bespoke lampshades for their lights which means you can get just the colour and fabric to fit your scheme.